Welcome to Cotterman and Company, Inc. 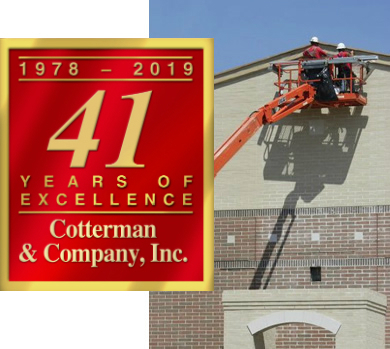 Since our inception in 1978, Cotterman and Company, Inc. has become an award winning leader in the Industrial and Commercial roofing industry specializing in New Construction, Reroofs, Roof Repairs and Roof Maintenance Programs. With over 85 qualified and dedicated employees, a fierce commitment to customer service, and offices in Dayton, Minster and Columbus Ohio, Cotterman and Company, Inc. has developed a reputation for quality work, quick response time, professionalism and getting the job done right, on time, and meeting or exceeding customer expectation. Select Cotterman and Company, Inc. as your roofing specialist and enjoy a lasting relationship that will merit your continued trust and confidence.